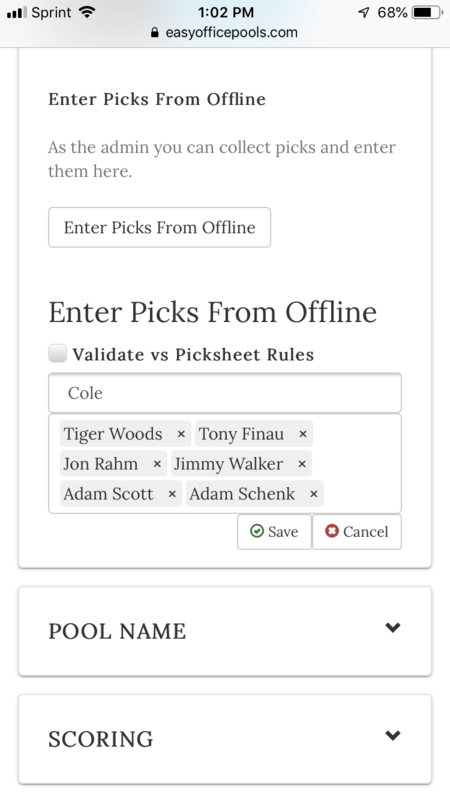 Hi – I run a golf majors pool and we select 7 players plus one alternate (if there is a withdrawal during the tourney). We also only allow 3 players from the top 15, the rest must be outside too 15. We do dollars earned and anyone cut just earns $0. Would this be a format your site could work with? Did you remove the free pool option? I keep trying to edit changes and it keeps emailing a link, but no place to edit. Does the system allow multiple entries per person? Or is it say limited to one entry per email? Will the pool still be free once the Masters starts? Hi Ryan – Only for pools of 4 or less. All other pools are $20 regardless of when they are setup. When are the results going to be published? Our pools average around 60 participants. 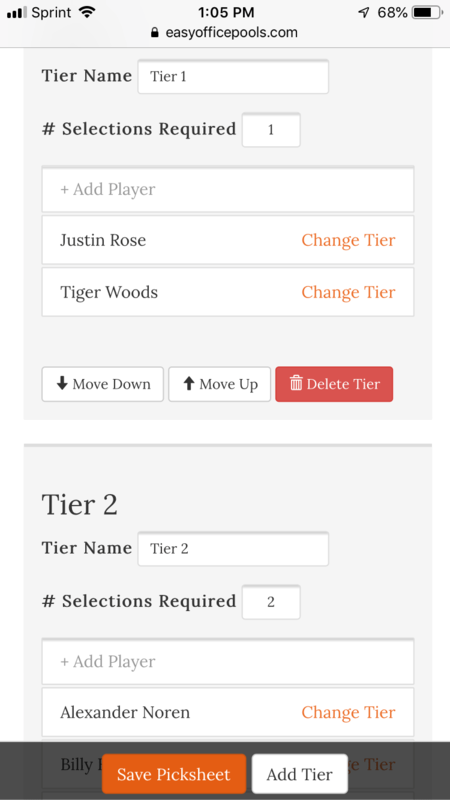 We create our own tiers (anywhere from 6-12 golfers) and choose 2 golfers from each. However, the fourth tier consists of the remaining field. Can your site accommodate this? 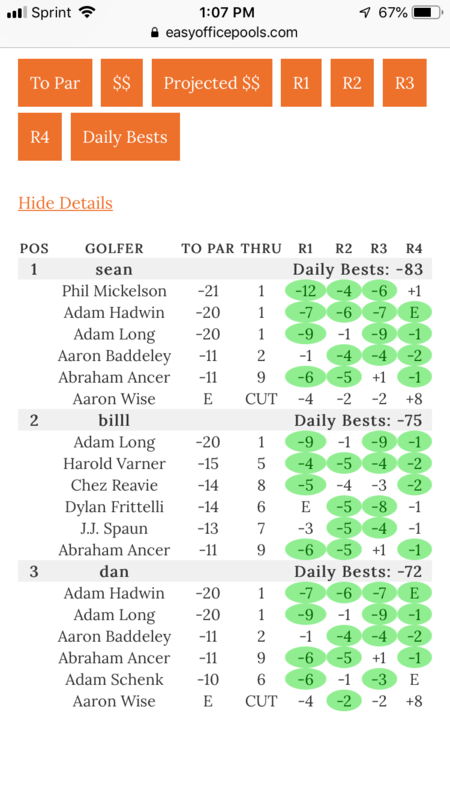 We use top 5 golfers, and you must have at least 5 make the cut. 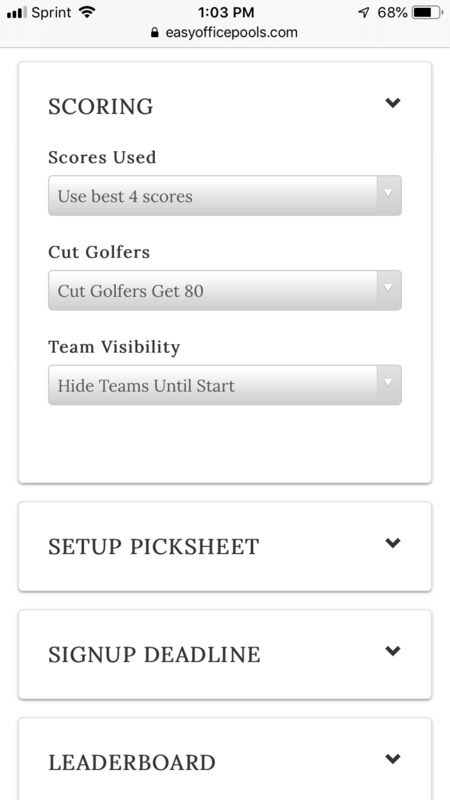 Does your site have live scoring? Or at least daily scoring? Does anyone know of any weekly PGA Tour golf pools to get into? 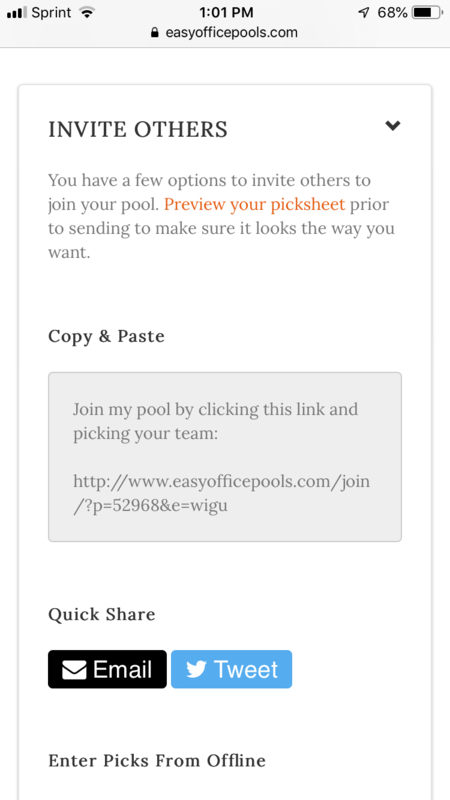 Hi Michael – We have most golf pools hosted on our site for each week. 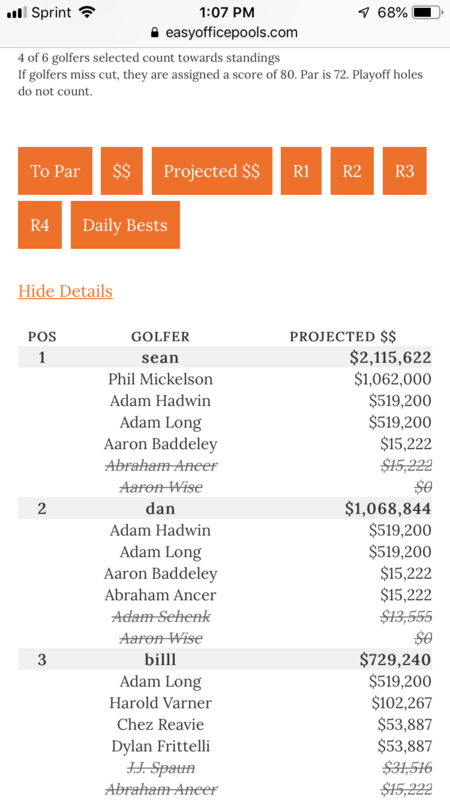 If you wan’t to keep the same team for the whole season you could try our PGA Money Earnings format where you get the earnings of your golfers for the year. We have a year long draft. Each team drafts 4 pga players and either one senior or one lpga player. You guys probably do not keep track of the ladies or seniors?? Is there a way to print out the sheet for people to fill it out because most want to fill it out on paper then I will put them in the system for them? A lot of players do not like to mess with the computer that is why I ask?? If there is a way to sign up and then print out a sheet that would be great. 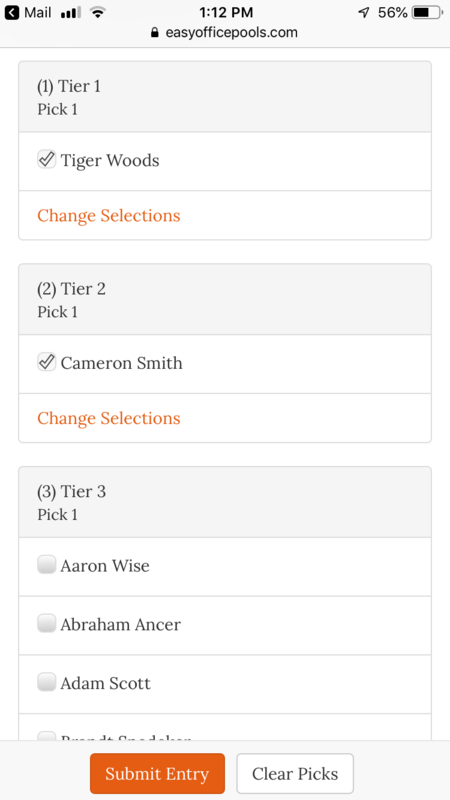 I have a lot of people whom would like to pick out their players on a paper and I will put them in on my own. Is there a way to print out a sheet?? 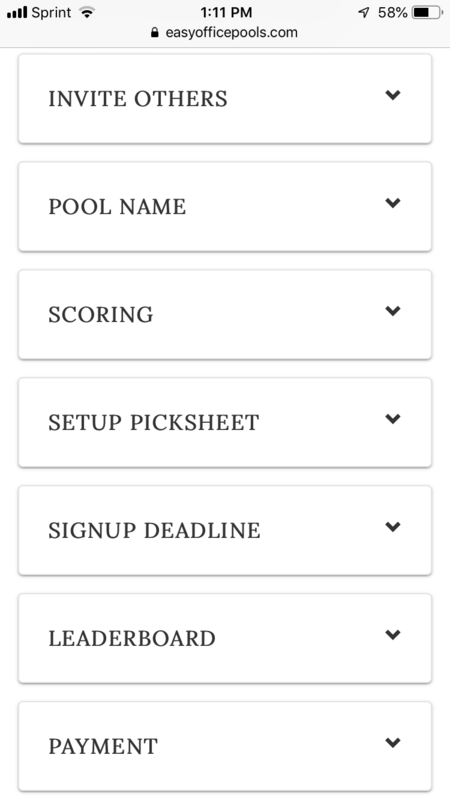 Hi – I just created a premium Masters Pool for this weekends tourney…but I can’t see where to add/choose the scoring method? I want to do the total money winnings that a person’s team of 10 golfers earn. 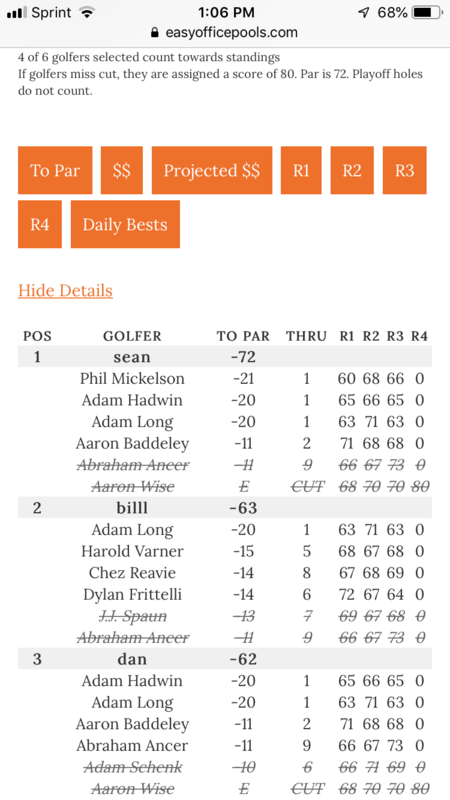 Once the current tournament has already started on a Thurs, what happens to PGA players’ scores in my easy office pool who either withdraw or get disqualified? Do they get the worst score of the round like I set up in my missed cut players? Do they get crossed out and not able to be used at all? We’re selecting 6 golfers, have to use 4. Thanks. Hi do you have plans to create a pool for match play tournaments like the WGC Dell?